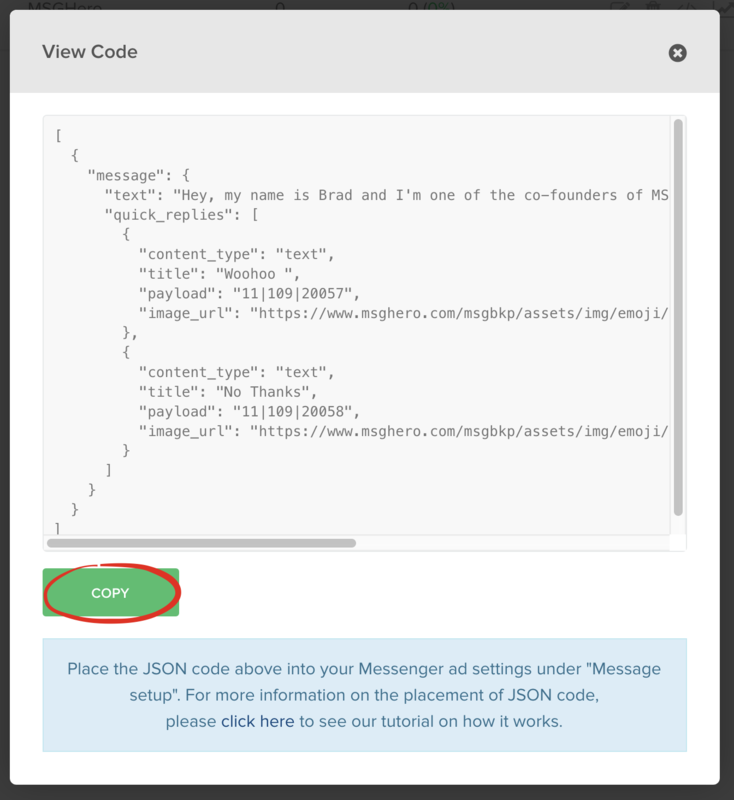 The JSON code feature inside of MSGHero allows you to create a structured message for your Messenger ads. Without a JSON code builder, you're basically limited to how you can run your Messenger ads as an entry point to your Messenger bot. 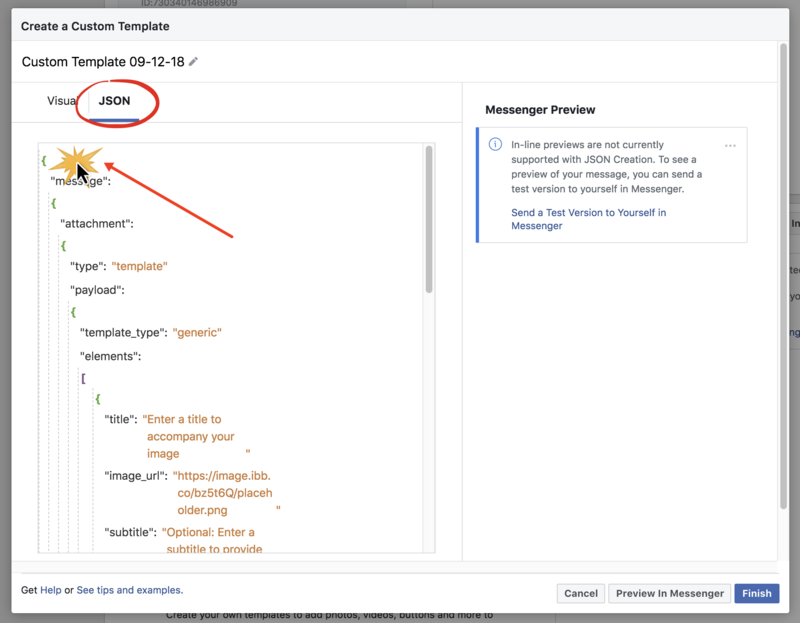 Running Messenger ads are a fantastic way to increase your subscriber count BUT there are some limitations with the experience IF you don't use JSON codes. Another limitation is that you can only use text (you can't include buttons, images etc). You're stuck with the annoying default "FAQ" template, or buttons linking outside your message to a website URL (no internal message-reply buttons). So, now you know why JSON is so valuable! 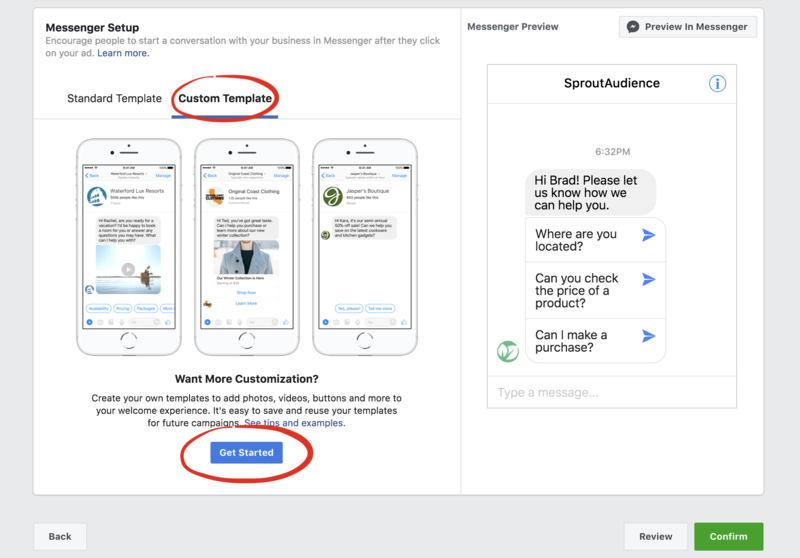 You can create an entry point that's a frictionless experience for transitioning your prospect from your Facebook ad into your Messenger bot - where they become a Messenger subscriber! 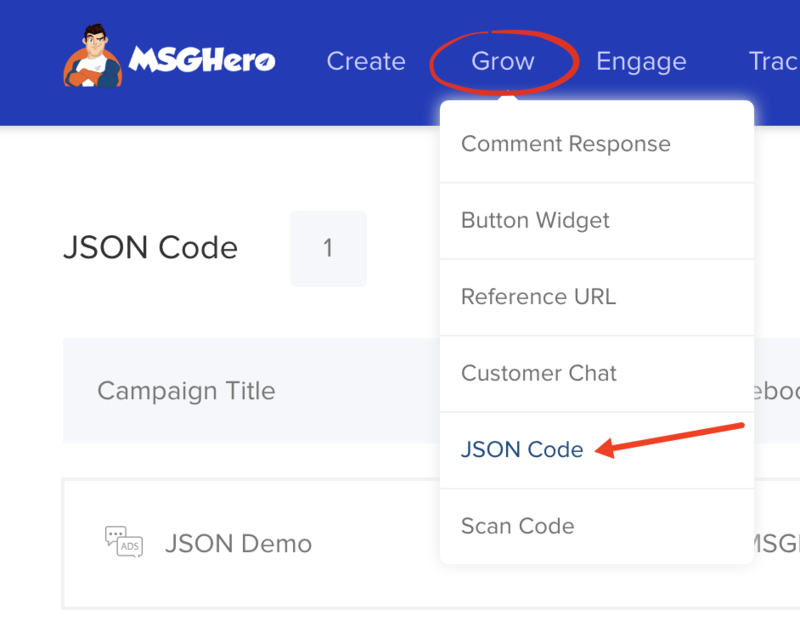 Click on "Grow" in the top menu inside of MSGHero and select "JSON Code" from the drop-down. 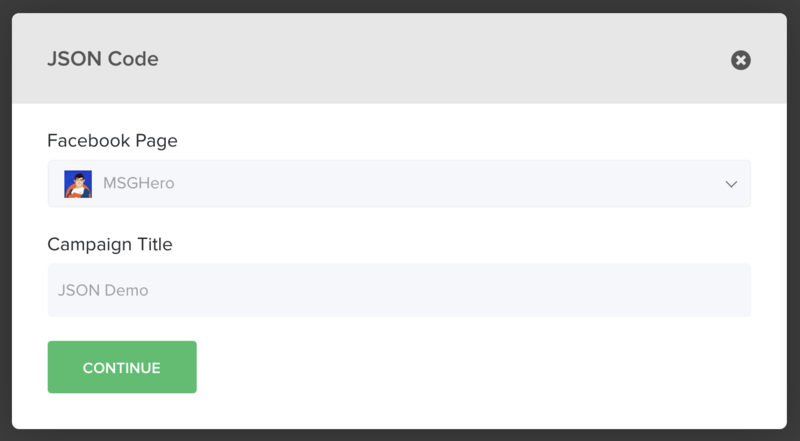 From the JSON Code dashboard, click the orange "+ New JSON Code" button in the top right corner. A pop-up will appear where you'll need to select your Facebook page (remember, select the same Facebook page where your bot is set up) and you'll need to set a campaign name (for personal reference). 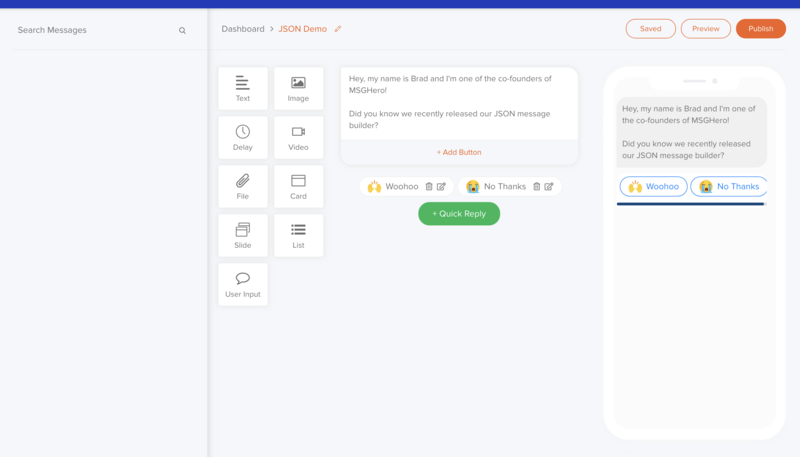 Next, you'll be taken to our classic messaging funnel builder where you can specify not only the content of FIRST message you want to be sent to people who click your Messenger ad, but also the follow-up responses. As you can see above, I've attached two quick reply buttons to my first message and each of those buttons will trigger a different automated responses from my Messenger bot. We can provide a rich, entertaining and engaging experience immediately. Once you've set up your messages, click on "Publish" in the top right corner of our classic message builder. When you're campaign is published, you'll be taken to the JSON Code dashboard. In the pop-up, you'll see a long script (this is the JSON Code). Click on "COPY" to copy the code to your clipboard. Once you have set up your Facebook Messenger ad (campaign type, name, targeting, placements etc), you'll be prompted to set up your message for your ad. Click on "Custom Template" and then click on the "Get Started" button as shown below. A pop-up will appear. Click on the "JSON" tab as shown below. Click inside the existing code and select all that code and delete it (make sure to delete it all, you can do this by clicking at the very top and selecting all the existing code and deleting it). Next, paste in the script you just copied to your clipboard from inside of MSGHero. 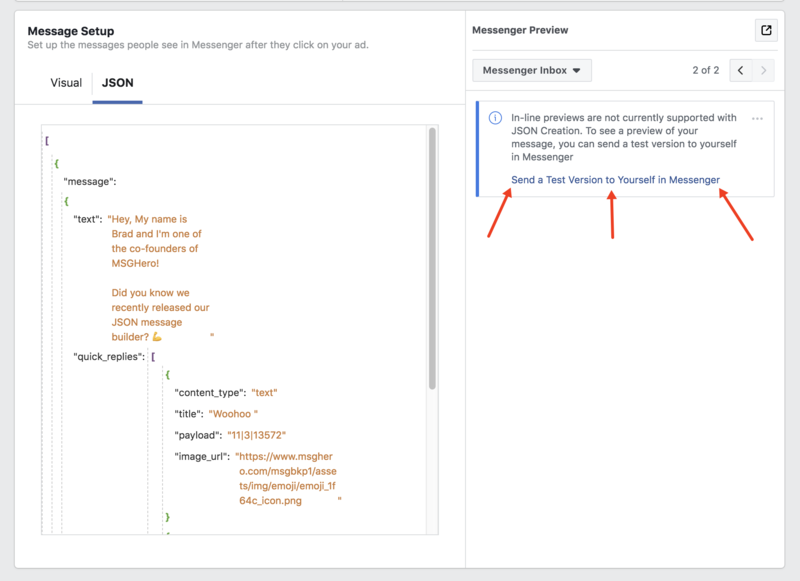 Facebook will take a few seconds to verify your JSON code and then you'll be able to click a link (as shown in the screenshot below) to test your message inside your own Facebook inbox (to verify it all looks correct). As you can see, transitioning your prospect to a Messenger bot subscriber through Messenger ads doesn't have to be such a dull and boring experience. Now, you can spice it up with buttons, images and more (and have them triggered directly into your Messenger bot as soon as they click on your Messenger ad). Please note: these limitations only apply to the first message in your JSON Code campaign. The limitations don't apply to attachment messages (messages attached to your buttons from your first message). You can't track the sent/read count of your main (first) message, but you can track stats as per usual with your attachment messages (follow-up messages/messages linked to buttons). When you change the status of your JSON Code campaign to "Off" in your JSON Code dashboard inside of MSGHero, if your Messenger ad is still active, Facebook will still send your message as per your JSON Code settings but your attachment messages will not be triggered.